Make the most of your fall days before winter gets here! The Destination Mansfield – Richland County calendar is full of live performances, traditional fall events, and the beginnings of Christmas activities. Learn something new! Come and listen to the TEDxMansfield (November 3) speakers for free at the Renaissance Theatre. Learn about the craftsmanship behind Mansfield’s famous carousel and see how a new, carved wooden carousel get made with Free Tours at Carousel Works (November 10). Discover the art of cooking like a pioneer at Malabar Farm State Park. Put together a traditional Thanksgiving feast without the trappings of the modern kitchen at the Hearthside Cooking Workshop (November 3-4) and Hearth and History (November 10-11) at Malabar Farm State Park. Heart and History attendees will also take a guided tour of The Big House. Explore the Ohio State Reformatory as they once again open their doors seven days a week for their Holiday Tours (November 24-December 17, 11 AM to 4 PM). Discover the healing powers of nature at the make your own salve workshop at Kingwood CenterGardens (November 3). Have an interest in the cosmetic arts? The Mansfield Barber Expo (November 18) at the historic Ohio State Reformatory promises to be a day full of barber battles, educational seminars, product demos, platform artists and giveaways. Still looking for something spooky as the days get shorter? Your last chance to Escape from Blood Prison is November 1-4. Grab your flashlight and explore the Haunted Capital of Ohio. Walk through the darkened halls of the Haunted Bissman Building for their last Public Ghost Walk (November 3) of the season. Take a guided Ghost Walk at The Ohio State Reformatory (November 30) or learn the basics of paranormal investigation during their late night Ghost Hunt Challenge (November 17, 24). Get out of the cold and see a show. Come enjoy the monstrously amusing antics of the infamous Victor Frankenstein’s grandson with Young Frankenstein at the Mansfield Playhouse (November 2-4). The always loveable Annie: The Musical takes the stage at the Renaissance Theatre (November 10-11, 17-18). You can also catch the latest showing in the year-long Stephen King Film Festival: The Mist (November 15) at the Renaissance Theatre. Enjoy a different kind of show at the Mansfield Toy, Collectible, and Sportscard Show (November 4). Toy collectors and fans of pop culture memorabilia won’t want to miss this one-day event at the Richland County Fairgrounds. Start the holiday season right. Head out to Snow Trails Ski Resort for their season kickoff Zozo Party (November 3). Enjoy live music, food, drinks, and a huge bonfire to awaken Ullr, the Norse mythological shepherd of snow. The Polar Xpress is coming to town. Downtown Shelby will be filled with smiles as your kids get the chance to meet Santa, Rudolph, the Grinch, and more familiar faces at the Ashland Railway’s Polar Xpress and SABG’s Moments of Christmas Magic (November 18) in Downtown Shelby. Your kids will also love Elf The Musical Jr (November 30, December 1, December 7-8,14-16) presented by the Mansfield Playhouse. Then let your little ones shop for you at the Tiny Tim Shoppe (November 24, November 30-December 1, December 7-8, 14-15, 21-22) at 128 N. Main Street. Volunteers will assist children ages 12 and under to shop and wrap gifts (all under $10) for their parents on-site. Get in the Christmas spirit with Christmas at Kingwood (Thurs-Sun, November 24-December 30). Enjoy live music, dozens of uniquely trimmed trees, photo ops, outdoor light displays. 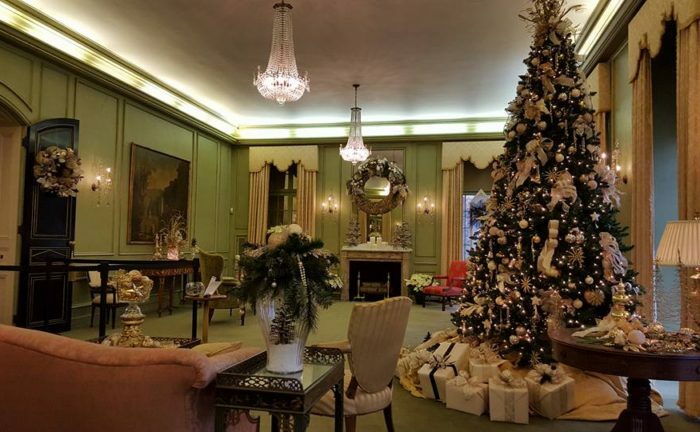 They’ve decked historic Kingwood Hall with dazzling decor and a towering 18-foot Christmas tree you won’t want to miss. Take a Candlelight Holiday Tours at Malabar Farm State Park (Novmber 30-December 2, December 7-9) and see Louis Bromfield’s Big House decked out for the Holidays. Enjoy freshly baked cookies, hot cider, and you may even see Santa Claus himself. First Snow: A Tribute to the Trans-Siberian Orchestra (November 24) brings the spirit of Christmas & the music of the Trans-Siberian Orchestra to life. Catch this amazing production for all ages at the Renaissance Theatre. Make the most of your fall and usher in the holiday season with all these events and more in Mansfield and Richland County. For a full list of area events, see the Destination Mansfield – Richland County Calendar of Events.